There has been a lot of buzz about USB cables and cable quality since the introduction of USB Type-C. These new cables are more complex than other cables delivering both power and data with more capacity and a reversible plug orientation. Much of the buzz is about the risk associated with higher voltage and current (up to 20V/5A) on the Type-C cable, while equally important is the ability to carry data at speeds up to 10 Gbps. The Advanced Cable Tester reads the DC resistance of each power and ground pin, measures the overall cable IR drop and confirms that you can safely use the cable at the limits of the Type-C specification. For full data throughput, the SuperSpeed signal wires are tested up to 10 Gbps and D+/D- wires tested for High-speed. Finally, continuity and the integrated e-marker electronics are tested. Simple results are immediately available via LEDs, and all test details displayed through an easy to read user interface. Additionally available accessory cards will allow you to test the complete selection of legacy USB cables: USB-A, B, Micro-B, DisplayPort, mini DisplayPort, Lightning, etc. 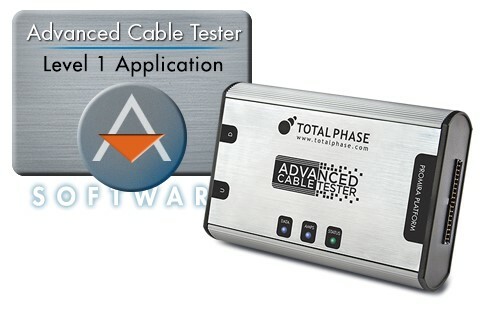 The Advanced Cable Tester will ship next week. We purchased the Promira to program flash chips in Quad mode for R&D. The unit is extremely versatile and well-priced. The software is simple and convenient but very effective. On top of that, the Total Phase sales and support folks are awesome! They're quick to respond to any issues and are great at following up on any suggestions or solutions.